Mexico has honored the United Arab Emirates’ current ambassador to Argentina, Saeed Rashed Obaid Saif Al Zaabi, for his efforts to obtain donations from his country to assist people affected by Hurricane Ingrid and Tropical Storm Manuel. Mexico’s ambassador to Argentina, Fernando Jorge Castro Trenti, recalled that those rare back-to-back storm systems battered his homeland’s east and west coasts in September 2013. Castro Trenti presented Al Zaabi, the UAE’s former ambassador to Mexico, the Order of the Aztec Eagle in a ceremony in Buenos Aires Thursday at the Mexican Embassy’s Benito Juarez Hall, diplomatic sources told EFE. 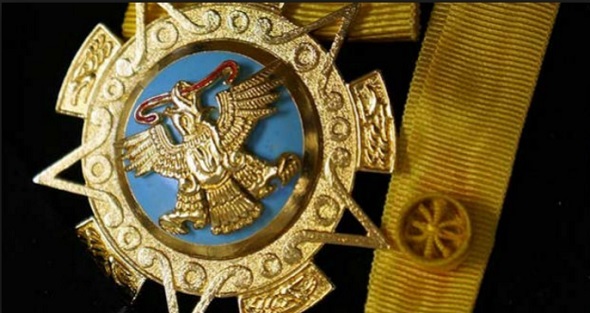 The Order of the Aztec Eagle is Mexico highest honor awarded to foreigners and is bestowed in recognition of their service to Mexico or humankind. Castro Trenti said that during Al Zaabi’s tenure as that Arab nation’s ambassador to Mexico a number of bilateral agreements were signed, including an investment promotion and protection deal and accords related to air services, the avoidance of double taxation and efforts to combat tax evasion. Other energy and economic agreements were inked with the goal of strengthening bilateral relations, the Mexican ambassador said. Al Zaabi thanked Mexican President Enrique Peña Nieto for the order and hailed the role Foreign Minister Claudia Ruiz Massieu has played in strengthening ties between the United Arab Emirates and Mexico. The ceremony also was attended by the ambassadors to Argentina from Saudi Arabia, Kuwait, Libya, Palestine and the Arab League, among others.